FRANKLIN, Mass. 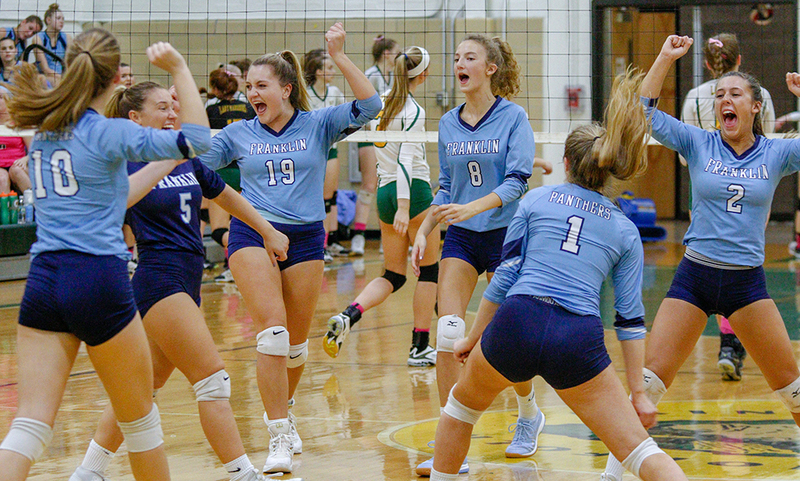 – In a battle of two of the top teams in the state of Massachusetts, the Franklin volleyball team gave everything the Barnstable Raiders could handle. The Panthers, who secured the Central-West sectional title in a dramatic five-set win, push the Raiders, champions of the South sectional, to the limit. But ultimately, Barnstable made one final run to come away with a 3-0 (25-17, 25-22, 25-23) win and a return trip to the D1 State Final. The Raiders are a perennial power in the state, having won the D1 State title 13 times since 2000 and entered Tuesday night’s match without having lost a single set this year. While that didn’t change, Franklin gave Barnstable its toughest test of the season and scored more points (62) against the Raiders than any other team has in 2018. Barnstable skated to a win in the South Sectional Final, beating New Bedford 25-3, 25-8, 25-16. It didn’t take long to see that Franklin was going to be a much bigger challenge. Each time the Raiders tried to pull away in the first set, Franklin stuck around. Kills from Ellie Wisniewski, Allyson Bonnet-Eymard, and Hailey Sanders each answered a point from Barnstable to keep the deficit at three. Barnstable built a six point lead at 16-10, but a 4-1 run from the Panthers again made the lead three points. But Barnstable senior Riley James, the state’s all-time leader in kills, showed off her skill. She had four kills (in the final eight points, giving the Raiders a 1-0 lead. James finished with a season-high 24 kills in the match. Franklin continued to battle in the second set, with six ties over the first 16 points, including at 8-8. Barnstable attempted to pull away at 12-9 but Franklin responded with a 4-1 run to knot the score at 13, getting a big kill from Maggie Doyle. The Panthers got a nice kill from Wisniewski from the back row after a nice dig from Riley Marino to pull within one at 18-17 but were forced to call timeout when the Raiders won the next point. Barnstable went up 22-19 on a kill from Ingrid Murphy (16 kills) but Sanders landed a kill from the middle to get within two. After Barnstable went back up by three, the Panthers forced a hitting error to make it a two pint game again. But once again, James was in the front row when the Raiders needed her most and she had two kills over the final three points to put Barnstable up 2-0. “We wanted to have four hands on [James] at all times,” Weymouth said, We wanted two girls to block her wherever she went. We were right there…right there. But it is what it is, the girls worked so hard, they did great. Barnstable went up 3-0 early in the third set but Franklin refused to fold. 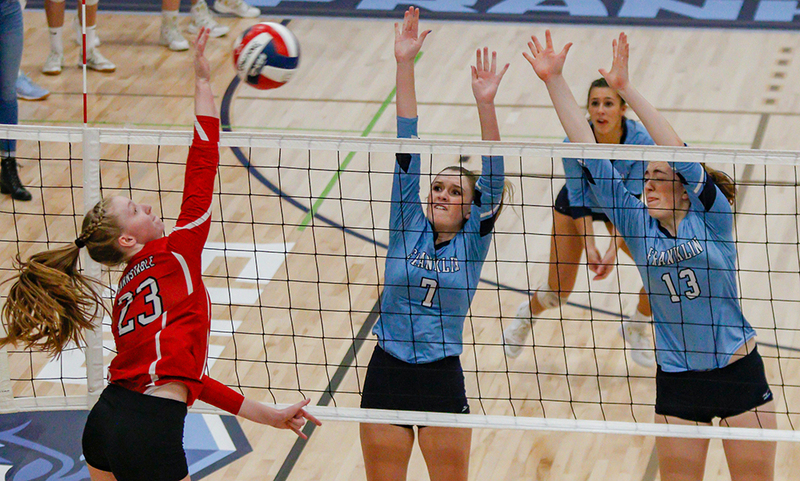 Franklin won seven of the next eight points to seize a 7-4 lead, highlighted by kills from Doyle, Sanders and Bonnet-Eymard — all on assists from senior Lauren McGrath. Franklin kept its lead, and stretched it to 14-10 on a big block from senior Lily Galluccio to force Turco to take a timeout. The Panthers let Barnstable back in the game with three errors over the next four points to knot the score. But Bonnet-Eymard sandwiched a pair of kills around a nice kill from McGrath to give Franklin a 19-16 lead, and again forcing a timeout from the Raiders. The Panthers led 22-19 after a kill from Doyle, and 23-21 after a service error from the Raiders, and were on the verge of giving Barnstable its first set loss of the season. Franklin’s Doyle and Sanders found a lot of success attacking from the middle spot. A kill from Murphy and a Franklin hitting error tied the game, and Murphy used a perfectly place push just over the net for the final point and the win. Franklin volleyball finishes the season at 20-1. WELLESLEY, Mass. – During a dominant regular season, Franklin was not pushed to five sets even once. In fact, the Panthers had only dropped three sets overall heading into the state tournament. In three postseason games, Franklin has gone to five sets all three times and has won all three of them. That pattern held again in the Div. 1 Central/West final on Saturday evening at Wellesley High. 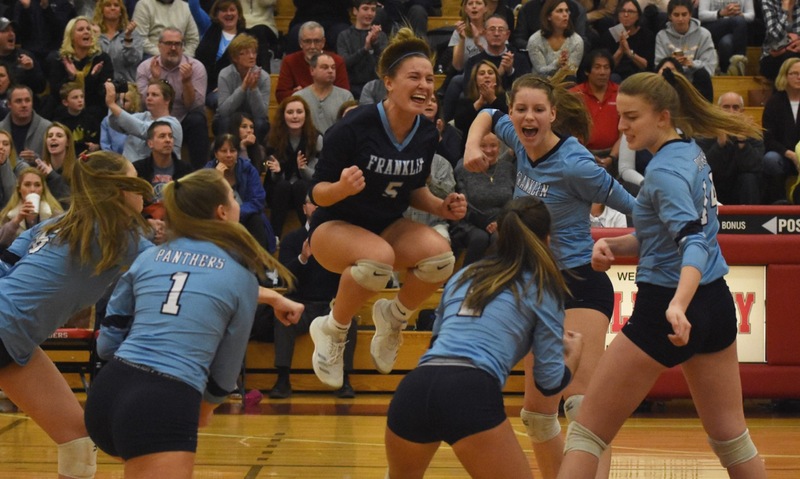 Franklin cruised through the first two sets, demonstrating why the Panthers are still unbeaten, but then Shrewsbury rallied to win two straight and force a decisive final set. Franklin jumped out early to win the fifth set 15-5 and secure the program’s first-ever sectional title. Franklin was on a roll at the start of the match. The Panthers took their first lead at 8-7 of the opening set and never relinquished it, winning 25-22 to get the early advantage in the final. Defensively, the Panthers were tenacious, led by libero RRiley Marino, and didn’t allow the Colonials to find any rhythm. The dominant play continued in the second set, as Franklin took the lead at 9-8 and carried the lead all the way to a 25-21 win. Shrewsbury was struggling to keep up with the balance in the Panthers attack, which featured streaks from a number of hitters, including five kills in the second from Ellie Wisniewski and strong hitting in the middle from Maggie Doyle and Hailey Sanders. The key to the Franklin attack was McGrath, who not only spread the ball around to all the hitters but always seemed to make the right decision as to who had the hot hand or who had the best look to beat the defense. Everything was going to plan for the Panthers until the start of the third set. It was as though a switch had been flipped and suddenly it was Shrewsbury dominating, the Colonials that never allowed a ball to hit the floor, and hitting every seam. Franklin kept it close at first, trailing only 7-5, but then the Colonials rattled off five straight points to take control of the set. Peyton Arone subbed in for the Panthers to give the briefest of sparks, but Shrewsbury kept adding to its lead and won the set 25-17. Any hope of the fourth set being different was put to rest quickly, as Shrewsbury raced out to a 9-2 lead. Serve-receive was a struggle, the Colonials were contesting every hit, and the Panthers couldn’t stem the momentum. Twice with Franklin hanging around, down by a handful of points, the teams put together long rallies filled with digs and great plays, but each time it was the Colonials that ended up with the point. After Shrewsbury won the fourth 25-15, Weymouth gathered the team to refocus it on the task at hand – being the first to 15 points in the fifth. Whatever was said in that huddle seemed to work. When the final set started, it was the Panthers from the start of the match that took the floor. Franklin pulled ahead 5-0 behind solid serving by Wisniewski and a kill from Allyson Bonnet-Eymard. Back-to-back kills by Doyle were followed by back-to-back kills by Lily Gallucio and a kill from Sanders. Suddenly it was 10-1 and it was Shrewsbury struggling to find any momentum. Wisniewski set up match point with a kill and Doyle finished it off with one of her own. The Panthers won the fifth set, the match, and the championship at a gallop. Franklin (20-0) will advance to the state semifinal and will host perennial state power Barnstable. Weymouth never won a sectional title as a player during a standout career at North Attleboro. The closest that she came was as a junior, when the Rocketeers lost to Barnstable in the South final. Although it is a different experience as a coach, she is enjoying every minute. Facing a team widely considered the best in the state is a challenge, but McGrath is relishing the chance to show that Franklin belongs in the conversation. WRENTHAM, Mass. – First-year Franklin head coach Kelsey Weymouth didn’t talk about her team’s chance to clinch a league title before its big showdown with King Philip, so she wasn’t quite sure if they knew. But based on how the Panthers played, especially early, it didn’t take long to figure out how prepared they were. “That was the best volleyball I’ve seen them play,” Weymouth said. “I wanted them to just play volleyball today, so I didn’t say anything. The first time we played KP was a competitive match, so we knew it would be even more competitive this time around. We focused our practice yesterday to gameplan for [King Philip], we tailored it to their strengths we so we’d be prepared today. While Franklin had a dominant showing in the first set, the Panthers had to rally past a resilient King Philip squad in the second set, and fight through a close battle in the third set to secure the 3-0 win (25-11, 25-21, 25-16). With the win, Franklin clinched the Kelley-Rex division title. It marks the program’s first Hock title since 2015 and first outright title since 2011. After a back-and-forth opening, Franklin used a 9-2 run to break the game open. Leading 6-5, the Panthers got contributions from all over to take the lead. Sophomore Allyson Bonnet-Eymard had an ace early in the run, Maggie Doyle (six kills) and Ellie Wisniewski added a kill apiece, Lauren McGrath (24 assists) landed an ace, and Doyle and Hailey Sanders (nine kills, two blocks) up with an emphatic block to put the Panthers ahead 15-7. After some back-and-forth, the Panthers went on another big run (10-4) to close out the first set. Bonnet-Eymard and Doyle had back-to-back kills, and Sanders and Emma Chase combined for a block to give Franklin the momentum. After consecutive KP errors, Franklin emerged with a 25-11 win. That momentum carried over into the second set with Franklin jumping out to a 7-1 lead, but King Philip responded with some nice swings and a 10-4 run to tie the game at 11-11 on a kill from Catherine Waldeck. With the teams tied at 16 apiece, KP rattled off three straight points, including a kill from Nicole Coughlan, to take a 19-16 lead and force a timeout from Franklin. The Panthers came out of the timeout and quickly tied the game with Sanders sandwiching a pair of kills around a nice push from McGrath to knot the score 19-19. Despite a timeout from KP, Sanders continued to have the hot hand and had a kill and a block kill (along with Chase) right out of the timeout to keep the momentum with the Panthers. “Hailey played phenomenal for us,” Weymouth said. “She finished with nine kills total, and we’ve been working with her this season to get her to hit like that. We knew coming in she was a strong hitter, and now she’s taking what we’ve taught her and using it. I saw a new player in her today, the confidence was there, she was smiling, and she was swinging away. KP tied the game with two straight points (21-21), but KP closed with five straight, including a kill from Peyton Arone (five kills) and an ace from Shannon Gray (three aces), to notch a 25-21 win and take a 2-0 lead. The third set started 4-4, but Franklin went on another big run to create the separation it needed. The Panthers won 11 of the next 14 points to build a 15-7 advantage. Sanders, Arone, and Wisniewski had three straight kills, Gray had back-to-back aces, and McGrath got in on the action as well with a kill. A big block from Waldeck helped King Philip get within three (down 19-16), but that would be the final points for the Warriors. Franklin finished with a 6-0 run, including three aces from Bonnet-Eymard to ice the game. Franklin volleyball (12-0 Hock, 13-0 overall) is back in action on Monday when they host Mansfield. King Philip (7-5, 7-6) will try to bounce right back as they return to the court on Friday against Walpole. FRANKLIN, Mass. – It doesn’t matter where Franklin volleyball is in its rotation on the court, first-year Panthers head coach Kelsey Weymouth is confident the offense can get it done. 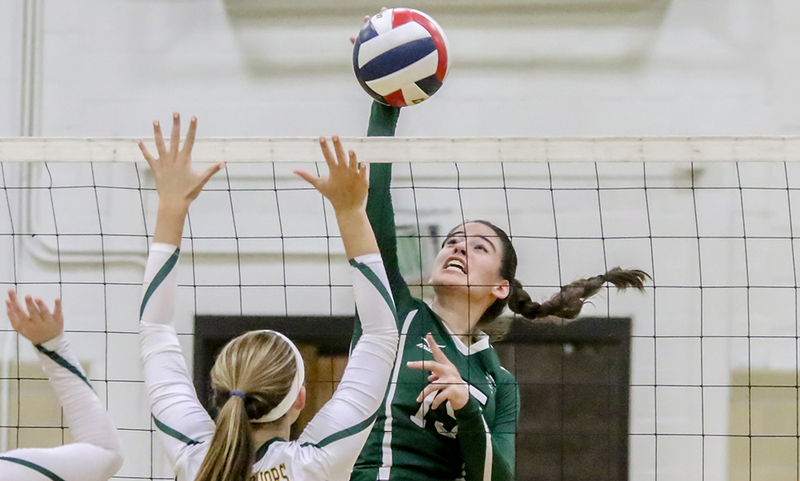 Franklin’s balanced offense was on full display on Wednesday evening, with five players registering at least four kills to help the Panthers sweep visiting King Philip, 3-0 (25-22, 25-18, 25-16). Senior Ellie Wisniewski (three aces) and sophomore Allyson Bonnet-Eymard (seven digs) tied for a team-high eight kills from the outside hitter spot, senior Hailey Sanders (two blocks) added five kills from the right side, and senior middle Maggie Doyle (three blocks) was responsible for four kills. And on top of that, setter Lauren McGrath (27 assists, two aces) provided an extra offensive punch with five kills. “No matter who is in the front row, I have confidence in them,” Weymouth said. “It’s a reassuring feeling knowing that whoever is up there, I have confidence they will put the balls down. The balance came in handy in an incredibly tight first set. Franklin’s largest lead was four points (three occasions) while King Philip led by three (9-6) early on. The set was tied on eight occasions, including at 13, 15, 16, 17, 18, and 19. Bonnet-Eymard, Wisniewski, and Sanders each had two kills in the opening set. Holding a 21-20 lead, Bonnet-Eymard smashed down a kill to put the Panthers up by two. Back-to-back errors from KP pushed Franklin near set point. The Panthers had two errors of their own but clinched the set with a net infraction. When KP had its largest lead of the opening set (9-6), Franklin responded with a 7-0 run to force a King Philip timeout. Two Warrior errors sandwiched a kill from Franklin’s Emma Chase to knot it 9-9. McGrath caught the defense with a dump on the second touch for a kill, Bonnet-Eymard followed with an ace, and Wisniewski slammed down back-to-back shots for a 13-9 advantage. For Warrior head coach Kristen Guess, it was all about unforced errors in the opening set (12 errors). “I definitely think the first two games we beat ourselves,” Guess said. “We made a lot of unforced errors, especially in the first game. It could have been a lot closer and it could have gone either way. We had a lot of miscommunication errors that we normally don’t do. We have a couple of young players on the floor that don’t have a lot of experience and I think that could have had an impact. I definitely think we need to communicate more. The second set was just as close as the first one. A kill from McGrath and a KP error gave Franklin its largest lead of the match to that point (11-6). But the Warriors quickly rattled off a 5-1 run, including an ace from Grace Ely and a kill and ace from Nicole Coughlan to bring the Warriors within one (12-11). But the Panthers responded by winning six of the next eight points. Wisniewski looked to have a kill an original attack but it was popped back up on a nice defensive play by KP libero Olivia Atkins. The ball floated back up by the net and Wisniewski reacted quickly, slamming the free ball back down for an 18-13 lead. Bonnet-Eymard ended the set with back-to-back kills to give the Panthers a 25-18 win and a 2-0 advantage. The Warriors kept close through the early stages of the third set but Franklin was able to create enough separation with a 4-1 burst midway through. Doyle and Bonnet-Eymard had back-to-back kills, and the latter added an ace for an 18-11 lead. KP got within four (19-15) but the home side was able to finish the game off. Riley Marino anchored the Panther defense with 10 digs. Ely had a team-high eight kills for the Warriors, Coughlan added seven kills, and Catherine Waldeck finished with six kills. Franklin volleyball (2-0 Hockomock, 3-0 overall) hits the road on Friday to take on Canton. King Philip (1-1, 1-1) is back in action on the same day when it visits Milford. Below is an update on former Hockomock League athletes currently competing in collegiate sports. If you would like to submit an update, please e-mail RyanLanigan@HockomockSports.com. The New England Football Conference First Team Defense had a Hockomock flavor this year. Craig Anderson of Franklin led Endicott’s defensive line this year and earned all NEFC First Team honors. Anderson found the quarterback nine times this year along with 44 total tackles. He was also named to the 2015 Capital One Academic All-America Division III football first team with a 3.86 GPA as a criminal justice major. Oliver Ames alum Dean Soucie led Western New England’s defense in his final season with the Golden Bears, totaling 83 tackles en route to a NEFC Conference Championship and was named to the NEFC First Team Defense. In just his second season with the Bison, Brett McEvoy of King Philip led the Nichols college defense with 96 tackles and two interceptions en route to an NEFC First Team selection. Several former Hockomock athletes contributed to Bridgewater State’s success this season. The Williamson brothers of Oliver Ames were a dynamic duo once again as Carlton Williamson rushed for over 800 yards averaging 5.2 yards per carry while brother Cameron Williamson shined at the safety position with 37 tackles and 2 interceptions. Senior wideout Michael Viola of King Philip played a major role in the passing game, totaling 35 receptions for 550 yards and six touchdowns this season for the Bears. Alex Jette of North Attleboro had a standout year for Brown University this season as a wideout and return specialist. Earning All-Ivy League honors, Jette was tops in the league with 136.60 yards per game. Jette led the Bears in receptions with 68 grabs for 928 yards and four touchdowns. The Castleton State Spartans were led this year by senior Quarterback George Busharis who totaled 2,183 passing yards along with 14 TDs while boasting a 62.6% completion percentage. The MASCAC also had a lot of Hockomock influence on its conference awards. Stoughton’s Joe Wilder, an offensive lineman for Framingham State, was named to the MASCAC First Team along with Taunton’s Asante Easter. Easter, a standout for Fitchburg Stated, finished off his football career for the Falcons contributing 44 tackles, an interception and a fumble recovery. Senior defensive lineman Anthony LaRose of Canton led the UMass Dartmouth defensive line this season with 45 tackles, including seven sacks. He was named to the MASCAC Second Team Defense. Fitchburg State’s Ty Spencer (Foxboro) shined in his senior season with the Falcons and was named to the MASCAC Second Team Offense. . Spencer caught 55 balls for 688 yards and six TDs. For his career, Spencer finished with the program’s all time marks in receptions (163), receiving yards (2,270) and touchdown catches (21) and was named the 70th annual Nils V. “Swede” Nelson Award winner for Division III for his athletic and academic (3.89 GPA) accomplishments. Brandon Alves of Stoughton finished up a strong career in Springfield this season with 14 tackles including a sack and a forced fumble. A pair of former Hockomock standouts were honored with All-Northeast 10 honors for the 2015 season. North Attleboro’s Eric Beckwith and King Philip grad Sam McDonald, both members of the Bentley football team, were named to the All-NE-10 second team. Beckwith, who was also on the second team last season, was an anchor on the offensive line for the Falcons. He started in eight games and had 10 appearances at guard. McDonald had a conference-high seven takeaways with five interceptions and two fumble recoveries. It’s the third straight year that the junior led the Falcons in takeaways. North Attleboro’s Paul Norris was selected to the CoSIDA Division II Academic All-America team. Norris is the sixth Academic All-America in Bentley football and just the third first-team selection after earning a 3.60 grade point average as a finance major with minors in both Spanish and natural and applied sciences. Paul McCarthy of North Attleboro finished his last season at Trinity College with 30 tackles to go along with five interceptions. The former Rocketeer was named to the NESCAC All-Conference First Team Defense. Mansfield graduates Dylan Finerty and Aurian Dawkins both had strong seasons for Worcester State this fall. Finerty notched 27 tackles while Dawkins had 35 tackles to go along with one interception. A Hockomock trio dominated the passing game this season at WPI. Quarterback Dan Eckler of Stoughton threw for 2045 yards and 15 TDs with help from his top two targets, Franklin’s Brandon Eccher and Stoughton’s Marcus Middleton. Eccher led the charge with 41 receptions for 644 yards and seven touchdowns including a 96 yard catch and run against Worcester State. Middleton also contributed heavily as Eckler’s other go to target compiling 27 catches for 305 yards and two touchdowns. Scott Levy of Canton finished up a successful career with the Bentley Falcons this Fall as he earned NE-10 All-League honors and earned a spot on the first team for the second time in his four year career. Levy tied for the team lead in assists with six and also added added goals this season. In his four years Levy started 52 games for the Falcons contributing 46 points with 19 goals and eight assists. North Attleboro junior midfielder Josh Ocel led the Brandeis Judges into the third round of the NCAA tournament after being named to the UAA Conference First Team. Ocel was selected as a second team All-American leading his squad with four goals and 10 assists, combining for 18 points on the season. Josh Ocel follows his brother Sam Ocel (2013) who was selected as a third team All American. Josh and Sam Ocel are just the second sibling pair in all of Brandies athletics to both get All American recognition. David MacKinnon of Oliver Ames started 16 games in net for the Hartford Hawks this season. MacKinnon earned a spot on the America East All Academic Team for the third time in his career. MacKinnon had a 1.19 goals against average, including three shutouts and has a 3.93 GPA as an accounting major. Foxboro alum Sawyer Fleck concluded with Bridgewater State by helping the Bears win the MASCAC Championship game. The Bears qualified for the NCAA tournament but were knocked out by MIT. Fleck played in 20 games and had six assists. Senior captain Taylor Sjoberg of Mansfield finished up a successful career at Mass Maritime this season. Sjoberg was a rock in the backline for the Bucs over his four years, starting every game this season, and also attributed two goals and an assist in his time as a Buccaneer. Chris Murray of Canton shined in his final season with WPI this fall. Murray tallied seven goals and 18 points which were both tops on the squad. Murray earned a spot on the NEWMAC All Second Team through his efforts this season. Former North Attleboro player Justin Freitas broke the Dean College record for goals (24) in a season and for points in a season (58) and was named to an NJCAA DI Third Team All American. Kristi Kirshe of Franklin led Williams College in scoring this season as the team won the Division III National Title. Kirshe finished the year with 33 points (12 goals and 9 assists) earning second team All-Region. After transferring to Boston College, Lauren Berman of Canton had an impressive first campaign with the Eagles. Berman finished fourth on the team in scoring with three goals and four assists. Mikayla Williams of Stoughton played her last games on the back line for Coastal Carolina this Fall..Williams has been a consistent player for the Chanticleers logging over a 1000 minutes a season for the past three seasons and also contributing two goals and four assists. Another former Black Knight had a standout year at Massasoit. Shelby Sprague was named an NJCAA Second Team All American after scoring 25 goals and picking up 54 total points. Sprague was the first Warrior to get All American since 1991. Junior forward Victoria Floeck of Taunton led the charge up front this year for the Fitchburg State Falcons. Floeck had two goals and three assists totaling to seven points on the season putting atop the Falcons scoring sheet. With 27 points (11 goals and five assists) senior Alicia Macomber of Stoughton was electrifying for Worcester State in her final season. Macomber was named the MASCAC Player of the Year for the second straight year after another strong season. Senior Abigail Tepper of Foxboro will be missed in a big way next fall. Tepper led the team with 68 points (30 goals, 8 assists). Her outstanding senior campaign landed her on the First Team All-Region squad and was named Player of the Year for the Commonwealth Coast Conference. Franklin’s Allison Burke had a solid year between the posts for UMass Dartmouth this Fall. She finished the year with 1.62 GAA including two shutouts. Mansfield’s Janet Maher helped lead the back line for Bridgewater State this year. In her only her second season as a Bear, she was named to the Little East Conference All-Second Team. Earning a spot on the Coaches Association All New England East Region All-Star Team Katie Notarangelo of Foxboro led the midfield for MIT this past season. Notarangelo also contributed two goals and an assist this season. Sammy Rondeau of Franklin proved consistent this season for Simmons College as she averaged just over a point a game for the Sharks. Rondeau finished the year with 23 points (nine goals, five assists). Fellow Panther alumni Elizabeth Alie found her stride this fall at Saint Anselm College. Alie led the backline for the Hawks as the team boasted their boasted GAA in program history. Alie earned NE-10 All Conference First Team honors along with second team All-American honors. It was a banner year for Babson volleyball and Franklin graduate Alicia Wilde played a vital role. Wilde had 273 kills, third on the team, for the Beavers who tied the program record for wins in a season. Playing for coach Eric Neely (brother of current Franklin boys basketball coach CJ Neely), Wilde finished her career with 944 kills and 569 digs. Former North Attleboro star Kelsey Weymouth concluded a strong four-year career for Stonehill. The two-time Hockomock League MVP finished her career with 707 kills (224 coming her senior year) and 839 digs. It was another year of Hockomock alums playing a big role for WPI volleyball. King Philip graduate Melissa Daigle was second on the team in kills with 250 (just one kill behind the team-leader) while also adding 148 digs. Franklin’s Shay Feeley was the team leader in assists with 441 and added 166 digs and 12 kills while Oliver Ames’ Caroline Meyer had 42 assists. 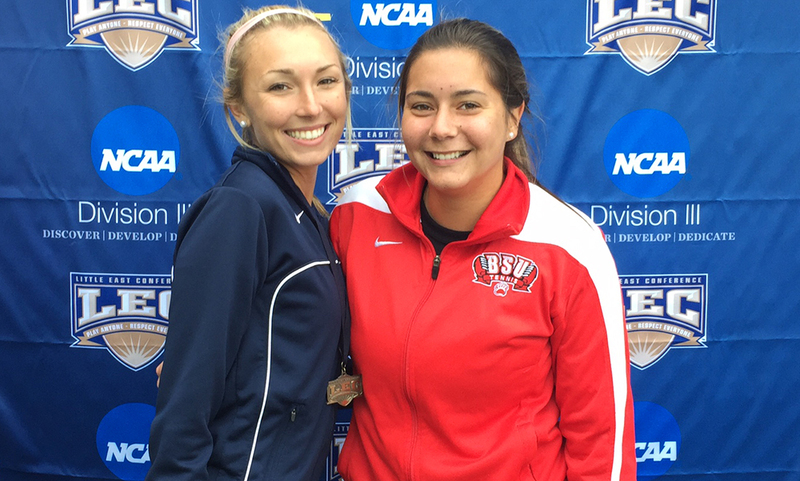 A pair of former Taunton teammates saw their teams go head to head in the Little East Conference’s Women’s Tennis Championship. Mollie McCaffrey and the UMass Dartmouth Corsairs were able to get the 5-4 win over Alisha Silva and Bridgewater State. McCaffrey lost at fifth singles but finished the Fall season at 14-3 overall in singles play and teamed up with Kristen Rose to win at third doubles. Silva lost at second singles but paired with Hayley Anderson to win at first doubles. Silva finished with nine wins with Anderson in doubles play this Fall and the duo was selected to the LEC Second Team. Foxboro’s Ty Spencer became Fitchburg State’s all time leader receiving leader this past weekend. Spencer hauled in six catches for 176 yards and a touchdown in the Falcons’ loss. He now has 137 career catches, which is five more than the previous record. Taunton’s Dan Belair continues to be a workhorse for AIC, a team that shutout New Haven and limited Stonehill to just one goal last week. Belair has played defense in all 16 games so far this season, with 15 starts, as the Yellow Jackets have allowed 1.63 goals per game on average. The junior is just one of three players on the team to have logged over 1400 minutes this season. 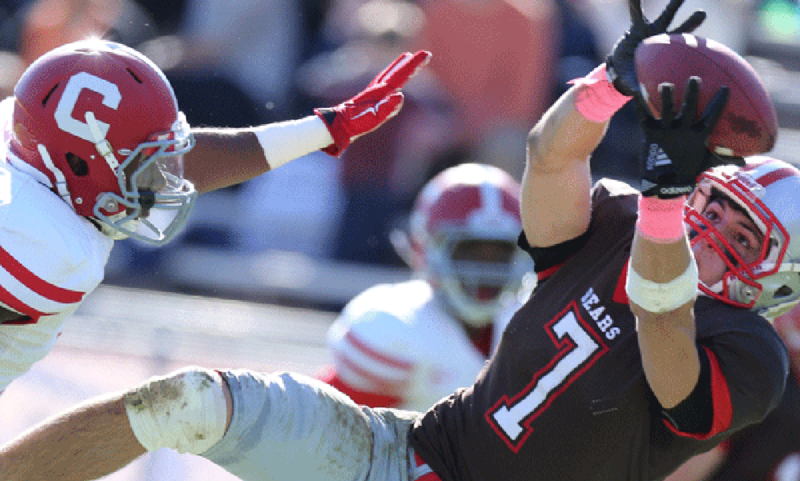 Alex Jette continues to have a standout junior campaign for Brown University’s football team. This past weekend, in a 44-24 win over Cornell, Jette hauled in a game-high nine passes for a game high 157 yards. Jette caught a 59 yard touchdown just 36 seconds into the game to give the Bears the lead. North Attleboro graduate Kelsey Weymouth continues to have success in Easton for Stonehill this year. 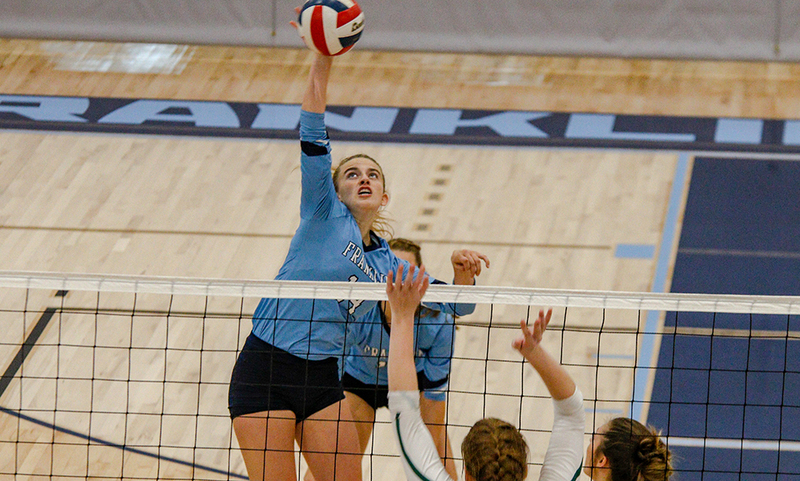 The former Rocketeer has a team-high 197 kills for the Skyhawks (10-12). Weymouth had nine kills in a 3-0 sweep over Assumption on Tuesday and had a season-high 19 kills against St. Anselm’s back in September. Former Oliver Ames league all star John Cerce netted his first collegiate goal in WPI’s 6-0 rout of Anna Maria. Cerce took a pass from Frank Ciliberto and fired a shot from 25 yards out to find the back of the net just over a half hour into the game. Cerce has appeared in five games this season for WPI while Canton grad Chris Murray currently leads the team in scoring with six goals and four assists. Former Franklin field hockey goalie Allison Burke is having a strong year in net for UMass Dartmouth. Burke has started in 16 games this season with an 11-5 record and has a pair of shutouts. Burke has made 85 saves and has a 1.61 goals against average. Taunton’s Katelin Morrissey has three goals and two assists and Attleboro’s Allie Kane has one goal for the Corsairs. Oliver Ames graduate Kristina Simonson has helped to anchor Babson’s defense, which closed the regular season out on a good streak. Simonson appeared in all 18 of the Beavers’ games this year and had four assists. To close out the regular season, Babson (12-3-3) allowed just five goals in the final eight games and had five shutouts in the span. Stoughton’s Mikayla Williams closed out the regular season with Coastal Carolina (11-6-1) and finished with two goals for her senior campaign. Williams scored her second goal of the year in a big league match against Winthrop earlier in October. While the Chants prepare for the postseason, Williams has two goals and three assists in her three years at CCU. Brenden Massey, a former standout for Attleboro football, caught his first career touchdown for Nichols over the weekend. Massey had a pair of catches in the game including a 17 yard touchdown catch in the first quarter. Massey has eight catches for 85 yards so far during his rookie campaign. KP’s Brett McEvoy had 11 tackles for the Bison against Salve Regina. Taunton’s Victoria Floeck has picked up three points since the calendar turned to October for Fitchburg State. The Falcons are having a tough year but Floeck scored her second goal of the season against Rhode Island College and then had her first assist of the year in a 3-0 win over Mass. Maritime, a win that snapped a long winless streak for Fitchburg. WPI volleyball has had a very strong year, posting a 19-7 record with one regular season match left. Leading the way are sophomore outside hitter Melissa Daigle, a KP alum with 231 kills, which ranks second on the team. Daigle also has 22 blocks this year. Franklin alum Shay Feeley has been WPI’s top setter with a team-best 409 assists (4.7 per set) and also had 159 digs on the season. OA graduate Caroline Meyer is third on the team in assists. Another King Philip alum, Brigid Murray, is second in assists for Westfield State. The Owls are 12-14 on the season and Murray has 274 assists this year. Murray also has 47 digs and eight aces this year. Former HockomockSports.com Boys Soccer Davenport Player of the Year David MacKinnon picked up his third shutout of the season just over a week ago when Hartford battled Binghamton to a scoreless draw. MacKinnon made two saves in the Hawks’ 2-2 draw on the road at Syracuse and made four saves in a 1-0 loss to SBU. Oliver Ames’ Molly Cunha scored the lone goal in the 61st minute to lift LIU Post to a win over Northeast-10 Conference opponent Southern Connecticut State just over a week ago. Cunha scored on a scrum in front of goal with less then 10 minutes to play. Cunha has three goals so far in her freshman year for LIU Post, which has been ranked nationally throughout the season. Bentley suffered a one point loss to New Haven over the weekend that saw a lot of former Hockomock players in action. King Philip grad Sam McDonald had seven tackles with a pass break up and an interception. North Attleboro’s Paul Norris had a tackle for the Falcons while Mansfield’s Kyle Wisnieski and Taunton’s Shane Wellman each fielded a kick return. Franklin alum Andrew Parent saw some time for New Haven in the win. Former Franklin star Colton Cardinal notched his first two career tackles for Boston College over the weekend. In the Eagles’ drubbing of Howard, Cardinal had two tackles that were both for losses. His first was for a loss of three yards and the second for a loss of two yards. BC is now 2-0 on the season with just three points against. Bridgewater State fell on the road on a trip to New Jersey but got some Hockomock alums made an impact. King Philip grad Michael Viola was the team’s leading receiver with four catches and 20 yards. Oliver Ames’ Carlton Williamson had a team-high 17 carries for 65 yards on the ground. OA’s Cameron Williamson was one of the top players for the Bears’ defense with five tackles. It was a defensive battle between Mount Ida and Plymouth State over the weeknd and a pair of two Hockomock alums played their part. For Mount Idea, Mansfield alum James Comer recorded three tackles. For Plymouth State, Foxboro’s Alton George had four tackles, including a sack and a forced fumble. A handful of former Hockomock athletes made their way onto the box score in Springfield’s win over UMass Dartmouth. For Springfield, Oliver Ames grad Colin Lozzi had three tackles and Stoughton alum Brandon Alves had one. For UMass Dartmouth, Mansfield’s Lou Petrella had seven tackles, Taunton’s Marcel Flynn had six tackles, Canton’s Anthony LaRose had five tackles, including one for a loss and Mansfield’s David Collins had one tackle. Western New England picked up a huge win over Westfield State, 31-0. For WNE, Foxboro’s Balaz Busznyak got his first touch of his collegiate career with a four yard rush, OA’s Dean Soucie had six tackles, a forced fumble, two tackles for loss and a pass break up. For Westfield, Mansfield alum Nick Bosari had nine tackles, including a half a sack, King Philip’s Pat Lydon notched a tackle and Stoughton’s Pat Raeke had a tackle. It was the connection between two former Hockomock stars that lead WPI to another victory over the weekend. Stoughton’s Dan Eckler tossed for 381 yards and a touchdown. That touchdown pass came in the first quarter on a 96 yard connection to Franklin’s Brandon Eccher, who finished with eight receptions for 168 yards. Stoughton grad Marcus Middleton caught a pair of passes from Eckler for 34 yards, including a 27 yard reception. Check out the video of Eckler’s pass to Eccher, courtesy of WPI athletics. Canton’s Chris Murray noticed a pair of assists to help WPI continue its undefeated start of the season. Against Framingham State, Murray linked up with Pav Christidis in the first half and then set up Ryan Tropeano for the game winner just minutes before the final whistle. Through six games, Murray has a team-best six points with a pair of goals and two assists. Former HockomockSports.com Boys Soccer Kelley-Rex Player of the Year Zach Scafati netted her first goal of the season for Assumption, but the Greyhounds suffered a 2-1 loss to LIU Post. Scafati finished off a corner at the back post. It was Scafati’s second career goal for Assumption after he scored his first last year at Saint Rose. North Attleboro’s Josh Ocel helped to deliver Brandeis head coach Michael Coven his 500th career victory against Babson – literally. Ocel’s free kick found the head of senior Jake Picard in double overtime to give the Judges the win. Ocel’s perfectly placed free kick into the area was headed home to the near post for the win. It was Ocel’s second assist of the season and second in the last three games. There was a lot of Hockomock influence in Wentworth’s 2-1 double overtime win over Mass. Maritime last week. It was Franklin’s Joe Kalil who tied the game in the second half to open up his 2015 account. For Mass. Maritime, Mansfield’s Taylor Sjoberg and Attleboro’s Eoin Grimes each started while Mansfield’s Alex Thompson made an appearance off the bench. Bentley picked up its biggest win of the season last week with an 8-0 throttling over Concordia. In the win, North Attleboro grad Jamie Grinavic scored her first two goals of the season inside a seven minute span. First Grinavic converted a breakaway and then just over six minutes later she slotted home her second. The matchup between Boston College and Providence over the weekend featured some of the Hockomock’s best talent from recent years. Canton grad and former Hockomock League MVP Lauren Berman picked up an assist for the Eagles. However, it was Canton alum Hailee Duserick and Oliver Ames grad Kendall Andrew and Providence that got the win. Andrew has started all of the Friars’ games while Duserick has started four and appeared in all eight. Former Stoughton standout Rachel Berkowsky netted her first goal of the season earlier this month in Eastern Connecticut State’s 5-1 win over Johnson and Wales. It was Berkowsky’s third career goal so far as the Warriors are off to a 3-1-1 start. The 2013 HockomockSports.com Girls Soccer Kelley-Rex Player of the Year Kristi Kirshe scored a game winner in overtime for Williams on Sunday to complete the Ephs comeback against Castleton. Kirshe’s goal marked her second of the weekend after she opened her 2015 account on the road at Trinity. Against Castleton, Kirshe put her shot into the side netting in the 99th minute for the win. WPI is off to a 5-1 start this season and a couple of Hockomock graduates have been a big reason. Franklin’s Shay Feeley leads the team with 83 assists, averaging 4.37 assists per set. Feeley also has four kills, 12 aces and 14 digs. Offensively, King Philip grad Melissa Daigle has 40 kills, which is second on the season. Her 49 digs rank third on the team and she also has six aces. Former Franklin star Alicia Wilde has helped Babson start with a 6-1 record this season. Wilde, playing for head coach Eric Neely, brother to Franklin hoops coach CJ Neely, is currently tied for second on the team with 46 kills, averaging 2.19 kills a game. Wilde has nine aces so far, which is second on the team and has 53 digs, which is also second on the team. Mansfield alum and former Hockomock League All Star Lauren Beecher has played a big role for Dickinson so far. Despite the team’s 3-7 record, Beecher has been strong with 57 kills, 13 blocks and 12 digs. Meanwhile at Stonehill, senior Kelsey Weymouth has helped the Skyhawks to a 4-3 start. Weymouth, a former North Attleboro Rocketeer, has a team-high 76 kills (3.04 kills per set), 10 blocks and 79 digs. In Stonehill’s 3-0 sweep of Dominican College, Weymouth slammed home a match best 12 kills with a 41% attack percentage. A pair of the 2014 Kelley-Rex winning Mansfield Hornets have helped Springfield off to a bright start. The Pride has gone 3-1 this season, allowing just five goals. Former Hockomock League MVP Allie Skinner has played in all four of Springfield’s games while fellow former Mansfield alum Hannah Boylan has appeared once. Former Hockomock League MVP Katie Notarangelo has played a bigger role for MIT in her sophomore season so far. Notarangelo scored her first goal of the season back at the beginning of the month when the Engineers beat Lasell College 6-3. The 2013 HockomockSports.com Field Hockey Player of the Year Kellie Stigas has only started one game for Northeastern this season but she ranked fourth on the team in points. Stigas has appeared in all six games so far and netted her first goal in a 2-1 win against Dartmouth. Franklin alum Samantha Rondeau is one of Simmons top players are just a sophomore. Rondeau has three goals and an assists for seven points. Simmons is off to a 5-1 start this season and Rondeau scored a gaol in a 2-1 over MIT and then added a pair of goals and an assist in a 9-0 blanking of Wheelock.